Who wasn't affected by September 11, 2001? Pretty much every one I know in real life was. A new story was released today about one man's experience taking a road trip during this fateful time named Dissolute Kinship: A 9/11 Road Trip in the form of a well written long essay. It was composed by a Canadian citizen who had planned on driving cross country at this time to celebrate a milestone birthday and sort some personal discoveries that occurred that year. He was completely unaware of what was about to unfold. Travel with him back into time to this fateful tragedy and see it through his eyes. David Antrobus has a beautifully captivating way of creating images in your mind while you are reading. He strings words together like fine pearls are strung on a necklace. You won't be disappointed. Fortunately his story was released just in time for the 10th anniversary of the tragic event. You don't need a Kindle device to be able to read the book. 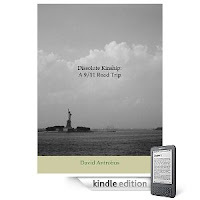 Amazon offers several free downloads for their Kindle books which include smartphones and PCs. On the right hand side of the screen when viewing the book, under where you click "Buy Now", are several platforms to choose from, or click HERE.